Planning your 21 Day Fix and 21 Day Fix EXTREME meals may seem a bit daunting at first, especially if you’re new to healthy ingredients or portion control, but with a little practice, you will see just how easy it can be to get your clean eating on track. With the 21 Day Fix Eating Plan, you’ll use color-coded Portion-Control Containers: Green Container for veggies, Purple Container for fruit, Red Container for proteins, Yellow Container for carbs, Blue Container for healthy fats, Orange Container for seeds and healthy dressings, and teaspoons for oil and nut butter. The easy-to-use containers eliminate the need for counting calories and take the guess-work out of weight loss. Depending on your starting weight, activity level, and goals, you’ll get a certain number of each color every day. 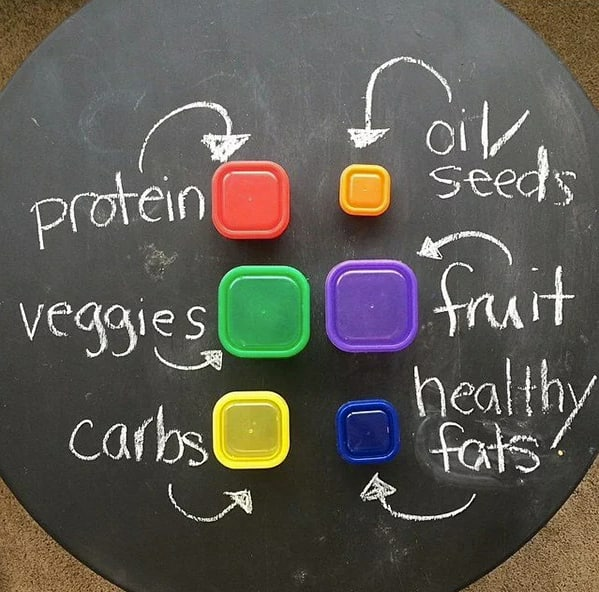 Find out more about the 21 Day Fix containers here. 1. Multiply your current weight in pounds x 11. This number is your Caloric Baseline.2. Add 400 (The Fix Calorie Burn) to your Caloric Baseline. The resulting number represents your Caloric Needs to maintain your weight.3. Subtract 750 (the caloric deficit) from your Caloric Needs. This number is the Caloric Target you should eat to lose weight. Using your 21 Day Fix Eating Plan guide, turn to the calorie chart on page 19, and find the column for your Caloric Target. 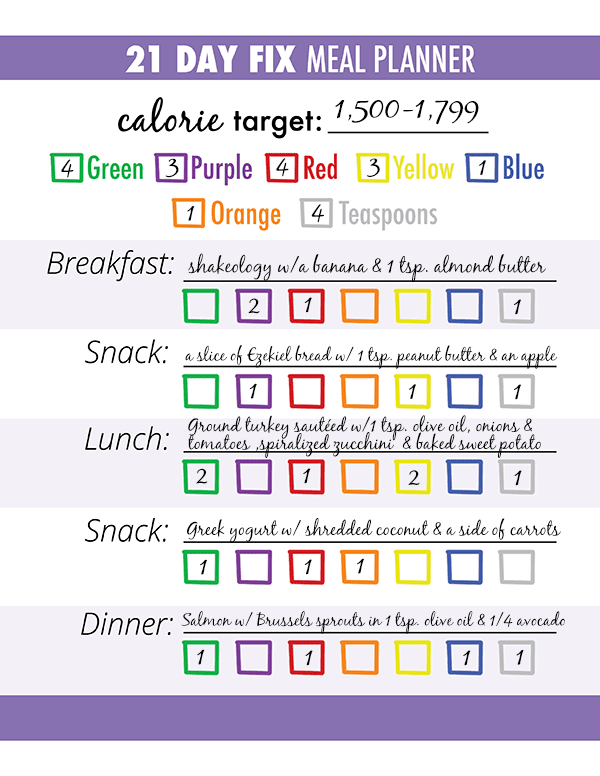 Your calorie bracket will determine how many containers of each color you should eat each day. Now it’s time to start planning. Go to the food lists in the 21 Day Fix Eating Plan Guide. Read through the choices and highlight some of your favorites for every container. Then, plan the meals for one day and mark down which containers they’ll use. Think about what types of food you would like to have at each meal and include some of your favorite healthy snacks. Don’t be afraid to start simple, with basic ingredients that don’t require much cooking, like yogurt bowls, sandwiches, and simple salads. Once you have the hang of it, you can introduce recipes and start planning meals for multiple days, or even a whole week. Now that you’ve seen how to plan one day of meals for 21 Day Fix, start to think about what you would like to eat for the next three to five days. Do you want to eat the same thing for breakfast each day, or do you prefer to switch it up? What about your snacks, lunches, and dinners? Do you have time to cook, or would you prefer to eat simply? Will you follow one of our step-by-step meal prep menus, or will you keep a selection of healthy foods in the fridge that you can combine to make meals? Which “free foods” will you add to your menu? Think about which herbs and spices you like and other calorie-free ways to add flavor to your meals. When you’ve figured out the meals you’d like to eat for the next few days, write them using the meal planner above so you can begin creating your grocery list. To find 21 Day Fix-approved recipe ideas, watch Autumn Calabrese’s FIXATE cooking show, get a copy of the FIXATE cookbook. You can also browse hundreds of recipes on the Beachbody Blog — each recipe lists the Container Equivalents. Set yourself up for success by creating a grocery list and sticking to it. Base your list on the meals you chose for the next three to five days. It’s okay to buy a surplus of these foods so that you have a little extra on hand, but try to stick to the amounts that match your calorie level and the number of containers you’ll be using to measure them. Remember that one Green container holds about one cup of vegetables, but if you can squeeze in more, you get to eat more! One red container-sized serving of protein is about four ounces (before cooking). If you plan to eat four Red containers of boneless, skinless chicken breast over the next few days, you would buy one pound of chicken. Keep in mind that some Yellow container foods that you might find in the bulk bins, like oats and brown rice, are measured after they’re cooked. 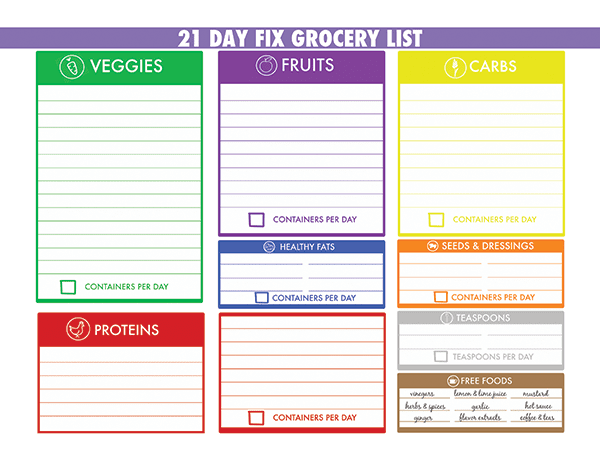 We created the color-coded 21 Day Fix grocery list tool below to help you get just what you need. It’s organized in the same way you’ll find those items in the store to help you save time. Notice there’s no box for junk food? If you do buy packaged or prepared foods, be sure to read the nutrition labels to make sure they don’t contain added sugar or other additives. Click the image below to download or print your Fix-friendly list. Roast all of your vegetables and bake all of your sweet potatoes at once. Chop all carrots, cucumber, bell peppers, and other raw veggies for healthy snacks and ready toppings for salads. Now that your shopping list is ready and you’re set to go shopping for your healthy 21 Day Fix meals. Don’t have 21 Day Fix? Get it here!